If its a combination of various service, there will be large number of groups and might not be maintainable. Role for service and ability for user to take up the role and ability to change roles would be much cleaner. I understand how answer C could be correct in regards to the link you cited. 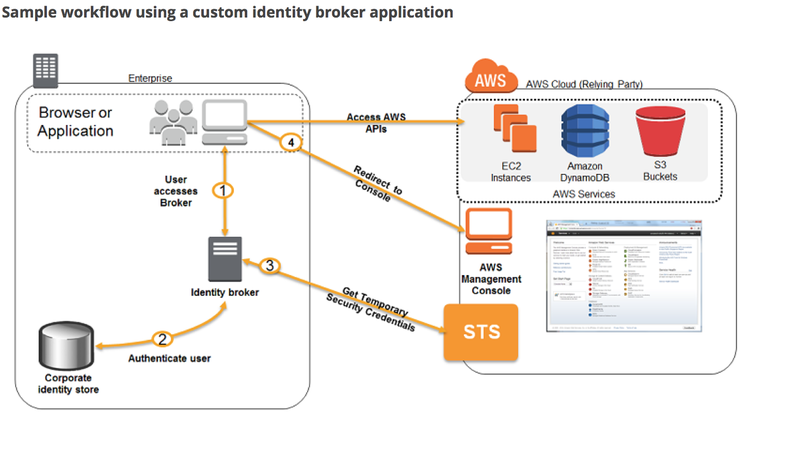 However, in the detailed steps it is actually a client app that calls the AWS STS to obtain the short lived credentials, not the identity broker. To me, this makes it seem like Answer C is technically incorrect. Answer B could be technically correct since the question does not specify if you are attempting to establish an API access or Management Console access. Hi Marc, a client app can actually be a Identity broker to help authenticate and connect with STS to get the short lived credentials. HSM can intergrate with application to decrpt . I am not sure what we looking in terms of centralized management .. ? Can you help me understand why Option D is wrong? you cannot attach an IAM role to a Mobile application which is installed in the Mobile but only to an EC2 instance. 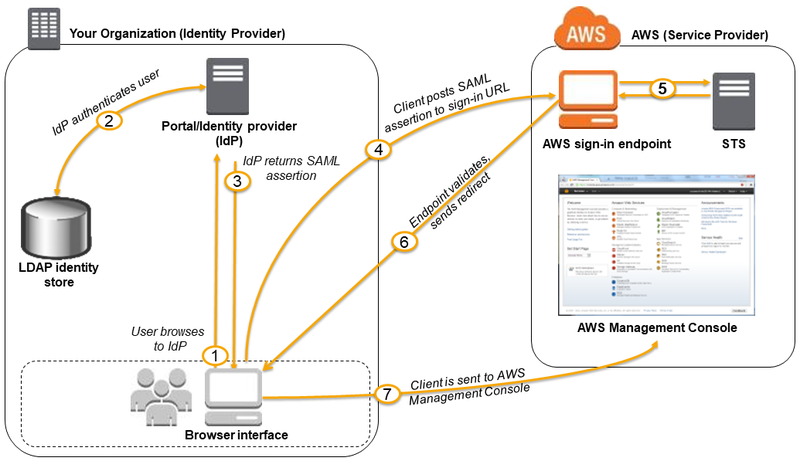 How do you achieve single sign-on with AWS? It’s using SAML 2.0 Protocol.. We don’t need to have Active Directory & LDAP Integration for this one..
What are use cases for SAML based Identity Federation (vs) and web identity federation ? usually to integration with organization ldap or AD or with any external Open Id service, so that the authentication is centrally controlled. if one of the use cases for SAML is to integrate LDAP with AWS, then why is the answer to Question 2 not SAML?? For question 3, choice is marked as B(RDS), however, this appears to me as C(Dynamodb), reason being question itself mentions millions of users, hence, RDS may not be appropriate choice? The only issue with C is, it does not mention the AssumeRole call which is key here. Else DynamoDB surely makes sense over RDS. ‘AssumeRole’ not make any sense here since this used by cross-funtion condition. ‘AssumeRolewithWebFederation’ should be the correct one. So I still prefer to pick up C as the answer. For Question 2, the answer C seems incorrect, it says “Use AWS Security Token Service from an identity broker”, my understanding AWS STS is not from identity provider? identity provider can be Amazon, Google, etc. but STS stays within AWS, right? I have a small query, i have created IAM User “XYZ” and i gave s3RO access and i created a role with s3 Full Access and attached to instance. i have 10 user with 5 RO and 5 full access to s3 bucket,how i can restrict read only to avoid deleting/uploading the files in bucket. As i am facing the issue is all 10 are getting full access i need ACL on role please advice. check what other permissions the user have, if you given only read only role then the users should only have those. Just a doubt on question 3, the correctly marked answer b) i.e. to use RDS as it says it’ll use “AssumeRole” with STS BUT my doubt is how the mobile app would directly interact with RDS to read/update meta-data (security wont allow RDS to expose on internet) unless we go with assumption that app would talk to API hosted on EC2 which interact with RDS?? 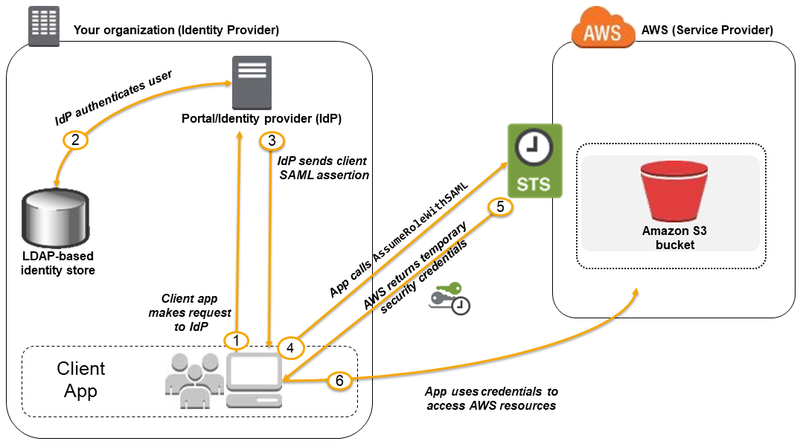 You don’t create temporary credentials using AWS Security Token Service with appropriate permissions. The permissions are defined by the role, which you need to specify or rather assume. It might be valid as you mentioned, it is just that B is more accurate and C is ambiguous.